A video about the way adults talk to kids is causing debate. It focuses on the ways adults can affect a child’s education through interactions with them. Although the response is varied, there’s no denying the power of its message. 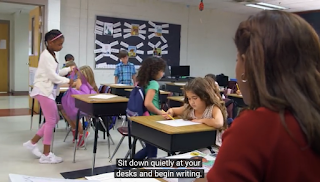 The Atlanta Speech School released a video called Every Opportunity and the story it depicts is eliciting a strong reaction from teachers and parents. It follows a little boy throughout his day at school and shows how the adults he encounters, from bus driver to teachers, interact with him. It starts with the child climbing the bus steps and giving the driver an enthusiastic hello that’s met with little more than a grunt. The boy tries to greet an aide at the school’s entrance and she ignores him. He asks the cafeteria employee for his student number and she’s short-tempered and impatient. His teacher grows annoyed at the behavior in his classroom and speaks to the children in a harsh tone. The second half of the video shows all the same scenarios, but with the adults responding to the children positively. By the end, the kids are depicted as their adult selves, confident and ready for the world because the teachers and staff gave them the encouragement and positivity they needed to succeed. The video is hard to watch and as such, is provoking a response from some teachers who say these interactions are not the norm and that they make every effort to treat their students with respect. Nonsense! Let’s demonize teachers as usual. The kids at my school beg to stay during school vacations and are sad when summer break starts. School is the most stable and safe environment for a lot of them. Yes adults should watch their tone with kids, but to make teachers out to be drill sergeants is unfair. In my 9 years of teaching, I’ve never seen the jerk teachers that are portrayed here. Every one I know works extremely hard to make sure their child is loved and respected. That’s why we are teachers. I agree that education is in need of reform, but this teacher-shaming video is ridiculously inaccurate. Teachers are the ONE thing in education that are doing what’s right by their students. WHILE SOME ARE SAYING IT’S AN EXCELLENT WAKE-UP CALL ABOUT THE AFFECT AN EDUCATOR (OR ANY ADULT) CAN HAVE ON A CHILD. I think this should be mandatory viewing for teachers!!! I’m a substitute and the lack of pleasantries I see regularly is so sad. Children are people too and deserve the same respect as adults. Be sure to watch the entire video… The first part models the negatives that do happen at times, but the second part shows the positives that typically happen throughout a school day. It’s a simple reminder and as a 21 year veteran teacher, I welcome the reminder of the importance of my role in children’s lives. Beautifully said… The first part of this video made me so sad. Than I recognized all the educators I know and it brought a smile to my face. I’m thankful for all the Educators I know and their commitment to the students they teach and love. This is so full of wisdom, it should be a learning tool for at home and at school. We all want to feel love and appreciated not shut out by rules and regulations. 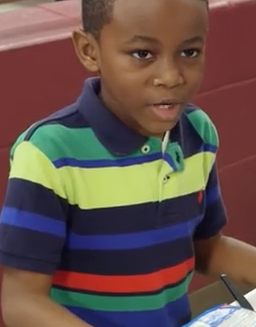 As the little boy in the video says, “talk with us, not at us.” It never hurts for parents and teachers to take stock of the way they talk to kids. They’re people too, and deserve to be respected and listened to so they grow up to be adults who do the same.